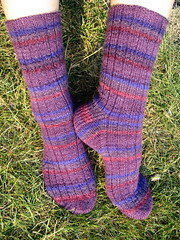 I'm wearing socks made with yarn that I dyed using the Machine Knitting to Dye For technique. Here they are, modeled in an appropriate setting. Happy Friday!